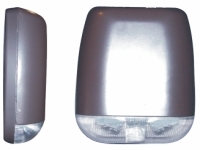 MOE Series - Die Cast Wall Pack - Signtex Lighting Inc.
MOE with die cast aluminum housing is designed for exterior use in wet locations but is also often used in interiors with potential hard use situations, such as gymnasiums, or hallways in apartment or condominium complexes. Rugged die cast aluminum housing and molded polycarbonate lens. Smooth curves allow this unit to blend uniformly with any architectural design. The most compact exterior emergency light available, the remote unit has a height of less than 2”: see specifications sheets. High power LEDs and prismatic lens produce an optimized elongated pattern along the path of egress. Custom finishes available, including brushed aluminum or other baked enamel finishes. Provides 1 Fc average emergency lighting along the path of egress from standard ceiling heights, with spacing up to 40 ft and forward lighting up to 30 ft.
Standard models have power consumption 8 watts in emergency mode and about 4 watts for night lighting or security mode. See how the MOE compares to the competition!